NASHVILLE, Tenn. (BP)—Bíblias Holman, the Spanish Bible publishing imprint of LifeWay Christian Resources, recently launched a new Spanish-language website, BibliasHolman.com. The website features new resources, articles and products designed to promote daily spiritual growth. 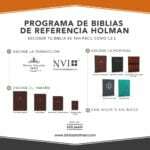 In addition to the website, Bíblias Holman is launching the “Holman Reference Bibles Program” to help Bible readers customize a Spanish Bible that best meets their needs. “Our new website provides a dynamic and modern application where visitors can find a Bible personalized for their needs through four simple steps,” said Cesar Custodio, marketing director for B&H Español and Bíblias Holman. “Customers can choose their translation preference—whether it’s the classic Reina Valera 1960 or the contemporary Nueva Versión Internacional—text size, cover and whether they prefer indexing or no indexing, all from their computer,” Custodio said. Through efforts like these, LifeWay and Biblias Holman affirm their commitment to providing biblical solutions and products to support the Church in her mission of making disciples. “We take the responsibility that God has given us very seriously for the creation of the best possible resources while carefully watching over the content that we publish,” said Cristopher Garrido, editorial director for B&H Español. For more information, visit www.bibliasholman.com.